I recently came across a couple wooden boxes I purchased from my friend Connie, at the spring Remnants of the Past show...that would be spring, 2010!. Would you believe they had been gathering dust in the hall closet for over a year? Typical behavior for me... a "gatherer of things". In our group of girlfriends we call it, "buying on speculation" (I bet you thought one could only do that in the stock market). You know, it's when you think you might make something from it but you're not really sure what the "something" is. I admit did get them out a few times but nothing really struck me until last week when I started thinking about how to use the buttons in this cup. Weird, I know but it just works that way sometimes. The wooden boxes have a glass lid that lifts up. I am not sure what they were used for. I was thinking a coin collection but that's just a guess. Maybe someone out there knows? They were not cheap...probably $30 each and they are all the exact same size 5 x 11 1/2". The circles are each 1 3/4" across. First, I cut a circle of cardstock the same size as the circle in the wooden box to use as a pattern. I retrieved my big bin of textiles and dug around till I found a piece of old linen. I cut a few circles and then a few from old paper. Then I just started laying them in the empty spaces till I got it to my liking. I started adding the embellishment in this order, lace, buttons, pearls, metal, glass, flower, words. 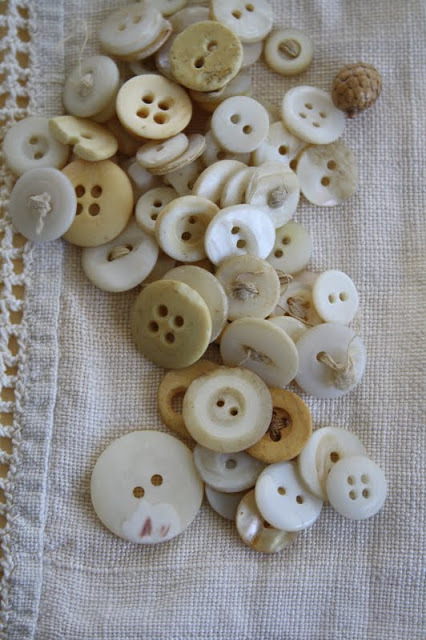 Sometimes words are the catalyst, but this time it was the buttons and lace. The pearls came from old necklaces I got a Farm Chicks...the vials from Ebay. The photo is from my friend and owner of Darkroom Door, Rachel Greig. Love these Photobooth strips, it is one of my "go to" items. Printed on super heavy weight cardstock they never have to be mounted on something and cut out, just use as is. The dried flower is from my backyard and the pearlized leaf is from Paper Valise (I believe they are sold out now). I cannot remember where I got the enamel pocket watch face but it fits just perfectly in the circle. The rhinestone circle is a small buckle that I stitched to the layers of dyed cheese cloth. I stitched the button right over the top of the center bar. The tatted edging in the bottom left corner is stitched together by hand. I am assuming there were two pieces made and the owner stitched them together to make a longer one. I could have avoided the break in the lace but I decided it was much more interesting to use it. I also chose vintage mother of pearl buttons that still had the original thread left in the button and just tacked them with a few stitches of matching thread. I added a number rubbing on the glass. STUNNING! Such a perfect and creative way to use that box and all those gorgeous bits of vintage goodness that would normally be too small to be noticed. I just LOVE this!! You did it again...created another great project! Thanks for your inspiration and also thanks for letting us in on your sources. Love your work! Your collage turned out so cute! I love it. It is GOOD junk! I love that! So inspiring to go to the antique store this week! What a beautiful piece of art! Nice job Paula! Fabulous! That box is beautiful and what you did to it is really just wonderful! Thanks for the inspiration! Amazing, do I see a new item down the road from the gypsies. Thanks for sharing, I always get inspired when I see all that can be done with the things we all seem to have stashed away. very very cool - i love the way you put things together. thanks for sharing your creative ideas with us! As always you rocked it out!! Now I am on the look out for one of these frames. Love the one with the rhinestones. SUPER cute. Beautiful love what you created with all the vintage items! This is so cool and absolutely stunning!! And, your artwork is already custom-framed. Can't beat that with a stick!